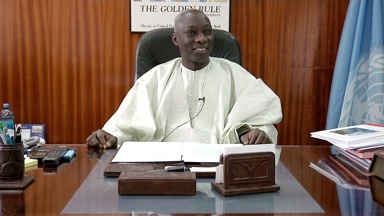 Batya Friedman: So, we’re continuing our interview with the registrar, Mr. Adama Dieng. I’m Batya Friedman, a professor at the University of Washington, and here conducting the interview with me is Judge Don Horowitz, and our cameraperson is Nell Carden Grey. And it is November 5th, 2008. BF: So, Mr. Dieng, we spoke of many, you spoke of many wonderful things in the first part of our interview, and one thing, a theme that has come up again is, has to do with, what’s the meaning of truth, and the traditional courts, the role of the traditional courts, and the possibility for the traditional courts. BF: Perhaps in a way, to think of this, is there are many tools for achieving justice; so there’s the international tribunal, there are national courts, there are traditional courts, and I’m wondering what – when you think of those tools and you think of the kinds of justice that you’re interested in achieving, what is your vision or view for how those could work together? If you could design something, how would you start that process, what would it be like, what would you seek to achieve? Well, talking about truth, to start with, is not an easy task. Because, when we talk about truth we have to first determine which truth are we talking about. You have the judicial truth; that is one thing. You have the historical truth, which is another thing. You have all, I would say, many forms of truth, and each of us, has his or her truth. And that is why when we refer to justice, even in a judicial process, where we have two parties – what is aimed through that process is, in fact, to search for the truth. And at the end of the process, when a judgment is rendered, the outcome of that judgment, is it really the truth? It, definitely, it is the judicial, maybe, truth, which has been discovered at the end of that process, a process which have involve the parties through a transparent and a fair process, but still you will have one party who may think that the outcome of that process was not the truth. And this brings me to quote the first Chief Justice of my native country Senegal, who used to be a judge at the International Court of Justice, in the year 1964. He was saying, at a time he was being sworn in as the first Prosecutor General, of the West African countries. (__), that was at a time of the, before independence. That day precisely, that was 9 November, 1959. You will know in my country, also, they say that death is truth, because nobody will, really, once you are dead, you are dead. There is no complication at all. But the ultimate, I would say, definition for me is just to consider that truth is another name of God. And God is also the light, and light is also assimilated to truth. And that is why it is extremely important in the situation of a post-conflict that we be in a position to determine what are we looking for? If I take the example of Rwanda, where you have had between 800,000 and 1,000,000 people who were killed in about 100 days, which mean an average of about 10,000 people being killed per day. This is something one could not really imagine. Bombs were not used like in Nagasaki, like in Hiroshima, but these people were killed with machete, with all type of instruments. To the extent that I always remember the fate of this Rwandan lady who was begging her killers to take a gun and kill her because she was suffering so much, being killed with those machetes. And she wanted to die quickly, to suffer less. After such horrendous crimes being perpetrated in that country, what can be done to reconcile the people of that country? Justice is and can be an instrument for reconciliation, but that is not enough, because even when you consider an ordinary case before a court, you will always have one party who might not be satisfied at the end of the trial, who might think that justice was not done to him – even the party who was wrong. But it happened, the party who was right, not being also happy because of the outcome of that trial. And that is why in the judicial process you have various degrees, because if you have one judge who render his or her judgment, if any of the party is not satisfied, that party has a recourse to appeal that judgment. And that illustrate, once again, the weakness, the weakness of human being. You are a judge, but you are, before all, a human being, that means you can make mistake, because only God is perfect. Not a single human being is perfect, only God is perfect. He is the perfecti-, the perfection. But still, it is important that we continue that search for justice and to make sure that at the end of the process the parties will accept that justice was done. And that is why when we talk about justice, we should always also bear in mind the two dimension – the retributive justice and the restorative justice. The retributive justice is the one which, for instance, we are applying here in the International Criminal Tribunal for Rwanda, in which we are searching for the truth and which correspond definitely to the modern way of delivering justice, focusing on the criminal offender. Because here, unfortunately, and I said unfortunately because that has been my position, we have not been able to focus on the victims. We only focus on the criminal offender. It would have been fair to also paid attention to the victims and I will say thanks to the (_____) made by this tribunal during the time of the drafting of the Rome treaty, establishing the International Criminal Court, a provision was adopted offering a role and a place to the victims of these types of crimes – genocide, or the crimes against humanity, torture, et cetera. While the restorative justice is the one which is really aim, like in the traditional way of delivering justice, to focus on the victim. Focus on the victims and his (__) healing and rehabilitation.